Looking to develop lean and sculpted muscles? This total body workout will keep you coming back for more! Discover new exercises to challenge yourself using body weight, steps, resistance bands, free weights, and stability balls. Carmen is the Fitness and Wellness Program Assistant for Aztec Recreation. She has worked in the fitness industry for over 10 years. Her interest in physical fitness started early in life as she was a competitive gymnast and later became a pole vaulter. She pole vaulted for University of Hawaii – Manoa for a year and a half. She attended Oregon State University for her undergraduate studies and Eastern Washington University for her Masters program in Exercise Science. She worked full-time at a high-level performance and personal training gym for several years in Spokane, Washington. She was also the head gymnastics and pole vault coach for a local high school. 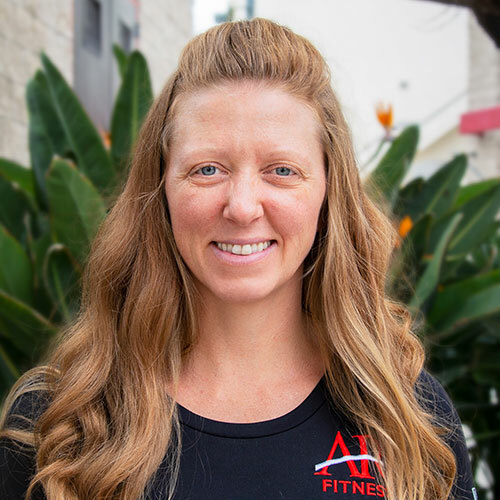 She is a NSCA certified strength and conditioning specialist (CSCS), yoga instructor, TRX instructor, Zumba instructor, and licensed massage practitioner (LMP). Carmen is passionate about health and wellness and loves to inspire others in their journey to optimal health! Her hobbies include hanging out at the beach and hiking with her husband and daughter!